Probably this is very uninteresting for most. HOWEVER, I found it fascinating and I’m the one writing so THAT’S EXACTLY WHERE WE ARE. So, a couple of people, over the course of the last week or so, have texted me this podcast. Last week was crazypants, due to multiple holidays of multiple cultures overlapping (Halloween/ All Saints Day/ All Souls Day/ The Day of the Dead), and seeing as I work church/ participate in cultural education/ belong to a culture myself…I only just listened to this today. Premise of podcast: a woman begins experiencing allergic reactions while eating meat. Why, yo? She ate it before. She loved it before. Why would this happen to her now? Wait up, you say, isn’t that something that you, Nell, struggle with as well? WHY YES AS A MATTER OF FACT. Hence the reason people sent me the podcast, probably. Do you want a sneak preview of the hypothesis? Ticks. The Lone Star tick to be precise. Apparently these buggers bite you, right? And, you know how if a mosquito bites you your body has a reaction to the mosquito-salvia and then that skin bumps into a red, itchy mosquito bite? Similar concept, except instead of a few days of frustrating itchy, the body decides that now every time meat is consumed, it will react to the components inside of the meat in a destructive way. Hence developed allergy. The weirdest, right? THE WEIRDEST. Like when she was talking about all her favorite foods (hot! dogs! I didn’t know I would miss you so much! Why?!?!) and how her medical professionals were like, “Heh, yeah right” (oh scenario I know all too well) and how now she is nervous to try meat ever again since the risks seem so high (and I feel the same way even though, unlike her, I have never ended up in an emergency room). Of course, I do still have questions, mind you. As do the medical professionals–apparently no one knows if this intolerance is permanent or if it quits over time. Also, as far as I know, I have never been bit my a tick. Also, according to maps, these ticks don’t live where I live. 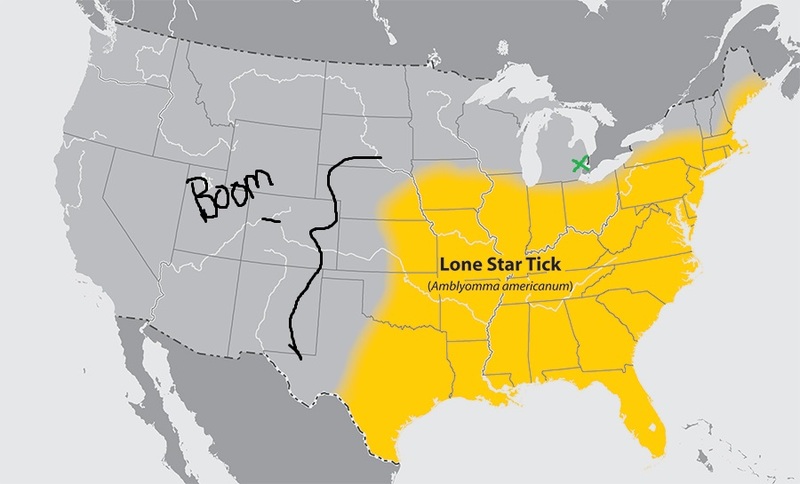 Yellow = where these ticks live. Green x = my general whereabouts. That being said: I apparently don’t live far from where lone star ticks live. And heaven knows I’ve hiked and camped and stuff in states where lone star ticks do live (AND IF THIS HAPPENED WHILE I WAS IN OHIO ONE TIME, OHIO, IF THERE WEREN’T ENOUGH STUPID REASONS FOR ME TO DISLIKE YOU BEFORE, MY PERHAPS FOREVER INABILITY TO EVER CONSUME HOT DOGS AT BASEBALL GAMES AND WEENIE ROASTS AND COSTCO AND STUFF…LITERALLY GET OUT. SECEDE THE UNION I HAVE NO USE FOR YOU) so who knows. Plus–gluten? Why would that be awful? That doesn’t fit at all, right? That being said: no answers, I guess. So, yeah, I guess there isn’t a huge point to this post. Except that I thought that this was interesting. So, yeah. Glimpse into my lifffffffffffffffffffffffe. Holler if your intestines hate you for no reason, too. Solidarity.